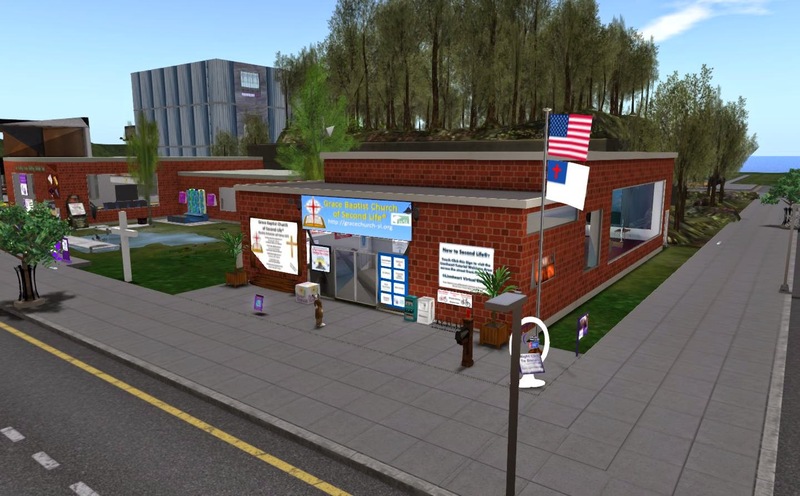 Where can one go in Second Life to go to church? One such location is the Grace Baptist Church of Second Life. Located in Lionheart Pumbaa, the location is the setting of an active church on the Grid that has several events every week. The church also has members in a Relay for Life team: Crusaders for Christ. The church makes it's home in the Lionheart Estates, which Becky Shaman described in an article last year, mentioning it at the end. The grounds are made up of two brick buildings, plus a yard between them. The building on the right (facing west) is the main one, where the congregation meets and most of the official events are held. Besides sermons, inspirational Christian videos are also shown in the chapel area. At the front of the building, one can get information about the church, or donate to a Relay kiosk. Not all meetings are held inside the building. In the yard area is a circle of chairs, which can be used for discussion groups. The left, or Southern, building is a game room with bowling, carnival, and arcade games, with a teleporter to a paintball arena. I met up with the pastor of the church, Pastor Bryan Sarjeant (leroy.zoon). So what defines a Baptist church from other denominations? "All Baptist Churches are independent churches joined together to support missionaries," Bryan told me, "We also all believe that (people) can only be saved or born again after they reach that age they truly know right from wrong - so no infant baptism." Grace Baptist Church is less than a year old, established on June 3, 2013. Bryan informed, "In first life I am a Southern Baptist Chaplain and my associate pastor (or co-pastor) has 15 years experience as a Southern Baptist Youth Pastor." The two had met in August 2013. Bryan is also a Relay for Life team captain, Team Crusaders for Christ, "I found out about Relay for Life through the Tombstone AZ team, "To Tough to Die" last season. I decided to start a church based team this year and we have members from multiple churches on the team. ... The office/HQ is on the other side of this region. 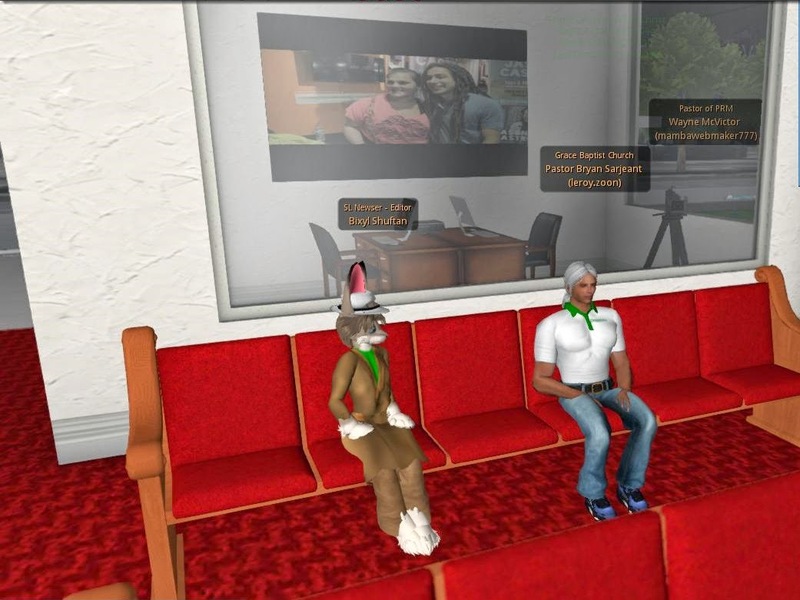 ... My home (real life) church actually has its own team so I am on two RFL teams - one in SL and one in real life. I am a retired army and a disabled vet. So while my wife and kids will walk the track in real life, I will be manning the tent." Grace Baptist Church has worship services on Saturday at 5AM and 5PM, and Sunday at 6:30 AM and 8:00 AM. Other events include a Wednesday service at 5PM and a Friday Night Bible study at 5PM. Live Stream of 1st Life Church Sunday at 6:30 and 8 am.